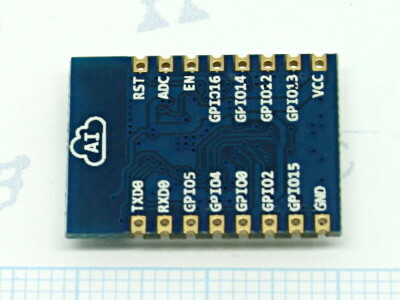 This is the ESP8266 ESP-07 module with ceramic antenna as well as an U.FL connector for external antenna and communicates at 115200 baud. The module breaks out all necessary pins of the chip to a 2x8 SMD header with 2mm pitch. No external circuits are needed.